A palette of colors, scattered like confetti decorate a signature Peruvian dessert. 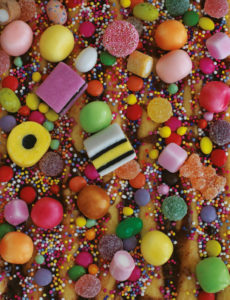 The flavored pastry, called the Turrón de Doña Pepa or Ms. Pepa’s Nougat, contains basic ingredients such as flour, water, shortening, butter, sugar, salt and eggs. A range of ingredients including anise, cinnamon, cloves, oranges, apples, figs, limes quince (similar to pears), sesame seeds and candy sprinkles amalgamate to create a unique flavor in this sticky October treat. The dessert originated near the capital city of Lima. According to legend, an Afro-Peruvian slave named Josefa Marmanillo, who suffered from paralysis in her arms and hands, created it in the 1700s. On a personal journey, she left her home in Cañete Valley (south of present-day Lima) to visit a black Christ painting in Pachacamilla just outside of Lima. The image, known to heal believers and grant miracles, cured Josefa. She created the dessert as an expression of gratitude to God. Turrón de Doña Pepa dessert. Image credit: www.cooked.com July 2018. Cristo Moreno’s own history emerges from Lima’s local spiritual landscape. In particular, Africans, both free and enslaved, revered his image. During the colonial era of the 1500s in the coastal city of Lima, Afro-Peruvian slaves worked the land and some converted to Christianity. As was common in the colonial era, churches and patrons often paid indigenous and African artists to paint portraits used to decorate colonial churches. In homage, artists rendered several images of Cristo Moreno. These paintings “were believed to please the spiritual forces that controlled the frequent earthquakes in the region”. According to folklore, in 1651 an Afro-Peruvian slave, named Pedro Falcón from Angola, painted an image of a black Christ on the wall of slave quarters in Pachacamilla. 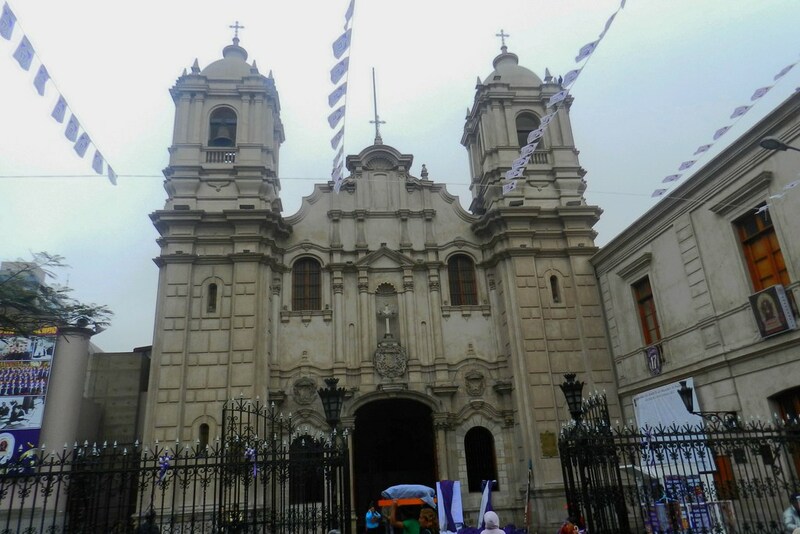 Las Nazarenas Church in Lima, Peru. Image credit: Rafael Gómez, Flickr. An earthquake hit the area in 1655 destroying churches and houses. In a sea of rubble the wall with the image of the black Christ remained. By 1687, locals built a chapel around the iconic image. That same year, another earthquake shook the city leaving the chapel in ruins. The image survived unscathed and endured a further earthquake in 1746. These events signified a miracle and ignited a stream of devoted followers. Even King Charles II (1661-1700) of Spain issued a royal order calling the painting El Señor de los Milagros or Lord of Miracles. The original painting stands as the centerpiece of the main altar at Las Nazarenas church in Lima. El Señor de los Milagros procession in Lima, Peru. Image credit: USI. Housed in the same church is a replica of the painting weighing two tons and is carried in a 24 hour procession once a year in October. Worshippers from all social classes dressed in purple singing hymns and praises “…accompany the image on its rounds through the oldest streets of Lima.” Karsten Paerregaard states most Peruvians of African or indigenous heritage identify with the black Christ because white people have remained a minority in Peru since the Spanish conquest. Processions of believers paying tribute to the image began in October 1687 and continue today as one of the largest Catholic ceremonies in the world. 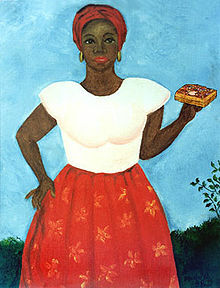 Josefa Marmanillo holding the Turrón de Doña Pepa dessert. Image credit: Wikimedia Commons, October 2008. Founded in 1556, Cañete Valley, named after Don Andrés Hurtado de Mendoza (Spanish noble Marqués de Cañete), became a key site of black culture. As with Pachacamilla, Afro-Peruvian slave labor dominated the agricultural valley during the colonial period. Josefa, cursed with paralysis in Cañete Valley and healed in Pachacamilla, had a dream of visiting saints. They left her with a dessert recipe that she shared with others. Prepared, sold and ate during the purple month of October, the Turrón de Doña Pepa compliments the celebrations of El Señor de los Milagros. Today, a number of bakeries, such as the Panadería las Nazarenas in Lima, sell the treat year round. It is known for its strong taste as the anise flavoring is similar to black licorice. For many it tastes better homemade. 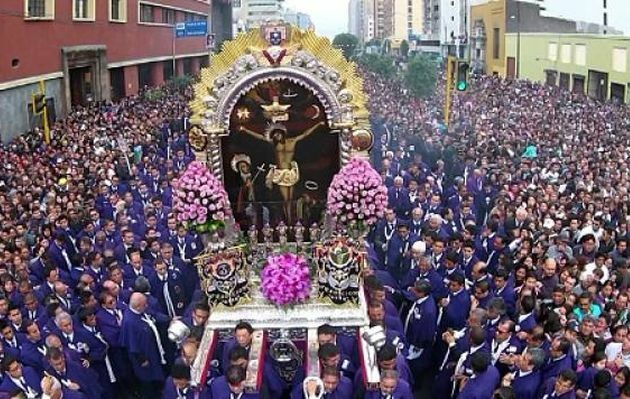 Religion mixed with food brings Peruvians in all shades of skin color to come together in October and celebrate Peru’s month of purple, passion, procession and pastry! Karsten Paerregaard, “In the Footsteps of the Lord of Miracles: The Expatriation of Religious Icons in the Peruvian Diaspora,” Journal of Ethnic & Migration Studies 34, no. 7 (September 2008): 1075. Cesár Ferreira and Eduardo Dargent-Chamot, Culture and Customs Latin America and the Caribbean: Culture and Customs of Peru (Westport, Connecticut: Greenwood Press, 2003), 42. Ferreira and Dargent-Chamot, Culture and Customs, 42. Martin Mejia-Associated Press. “AP PHOTOS: Peru Venerates Lord of Miracle in Big Procession.” AP English Worldstream-English. Associated Press DBA Press Association, November 2, 2017. Roberto Sánchez, “The Black Virgin: Santa Efigenia, Popular Religion, and the African Diaspora in Peru,” Church History 81, no. 3 (September 2012): 637. Michelle M. M. Hancock is a graduate student in the Historical Resource Management Master’s program at Idaho State University. She has a Bachelor of Arts-History from Idaho State University (2018) and an Associate of Arts-Biological Science from Arkansas State University-Beebe (1993). This blog post was written for a class with Dr. Kathleen Kole de Peralta.